I say, bring it on, Apple, because Intel customers on both Mac and PC could benefit. (Especially since we know Apple’s negotiating style with its vendors is rumored to err on the “we’ll break your kneecaps” side.) Intel won’t say what form this influence is taking (insert Apple joke here), but the easy guess would be heat generation and power consumption top the list. That’s good news for the music market, of course, because these have been ongoing challenges. More computing power for less electrical power and heat is always a good thing. We’ve seen some very smart music-savvy designs featuring the Pentium D and other newer Intel chips, but you can always have more progress, particularly in the laptop space. It’s also possible this “influence” on Intel has to do with more archaic issues, since Intel has tended to influence computer design rather than the other way around. I’m sure what Mac users are wondering is, will the next generation of MacBooks and MacBook Pros run a little cooler? Meanwhile, Intel claims it will win back market share from AMD with a new chipset. AMD has bombarded the blocks around CDM headquarters here in Manhattan’s Wall Street/Financial District claiming otherwise. So I can either believe the banners that I see every time I leave my apartment, or I can listen to Intel talk about chipsets in the future tense that will be faster and less power-hungry. Okay, third option: I’m holding out for the new machines to actually ship. In the meantime, I think PC users can be grateful to have something Mac users lack: access to dirt cheap, bargain-basement deals on some very fast 64-bit, dual core CPUs from AMD. That’s why the machine I’m building for gigs this summer will have AMD Inside. 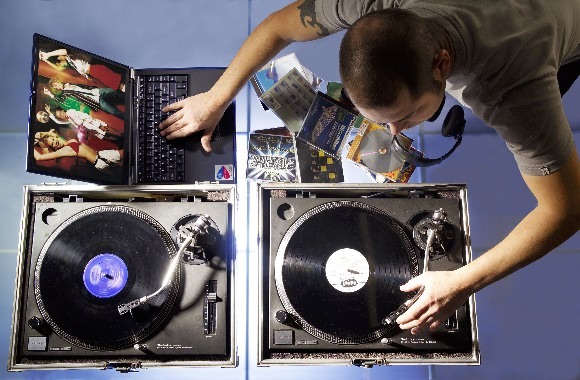 In other news: apparently Intel has developed new technology by which you can DJ without cords, as pictured here in this image from their press archive. Look, you don’t even have to plug in the turntables. Awesome. M-Audio Clones GarageBand for Windows, But Will Windows Users Care?